Collections MAX Collector is the is the FREE debt collector module used by debt collectors to work accounts. Please note that this software is meant to showcase off our features and is not meant for production use as it has the following limitations. Limit of 1,000 total system accounts – The maximum number of accounts you can have in the system using this free module is 1,000 accounts. Limit of 5 collectors – The maximum number of collectors you can have in the system at one time is 5. Limit of 200 accounts per collector – The maximum number of accounts you can assign a collector at one time is 200. Limit of 10 minute sessions – The software will log you out after 10 minutes. All of these limitations are removed with our Collections MAX Professional product. Collections MAX Collector is the software your debt collectors will use to collect on accounts from your debtors. 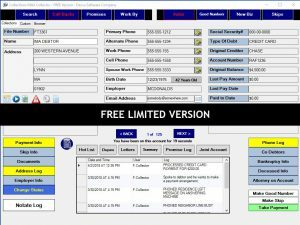 This is the free module and has many limitations and is not designed for production use but is used to show off the features of our paid version….Collections MAX Professional. The interface is point and click and extremely user friendly. 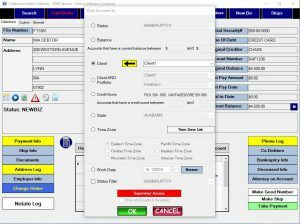 This software is considered by many to be the easiest to use and is part of one of the most powerful debt collection software systems ever devised. Here are a list of features for Collections MAX Collector. Easily search through your database to bring up debtors when they call in. You can search by phone number, file number, account number, custom fields, first name, full name, last name, email address, social security number, or an ALL search that searches all database fields. Searches can be restricted to just the accounts that are assigned to the collector. Easy one click of any white field to change account information. Blue fields require supervisor access to change. Buttons will turn yellow on screen when there is information behind them giving the collector a “snapshot” to see which information is available without needing them to search the screen for information. 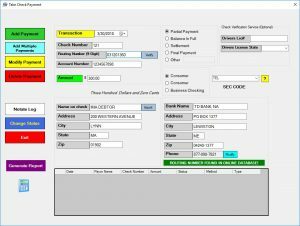 Easy to use next and back buttons for collectors to scroll through accounts. Accounts can either be worked in order (last work date) or can be cherry picked using our Inventory Viewer. Collector notes from any debtor can easily be exported to Pdf, Excel…etc. Collectors can put accounts into virtual ques and work them. Powerful workby system allows collectors to work accounts by status, balance, client, client and portfolio, credit score, state, time zone, and work date. 60 custom fields in the custom tabs allow you to add references, alternate phone numbers, bank account information….etc. 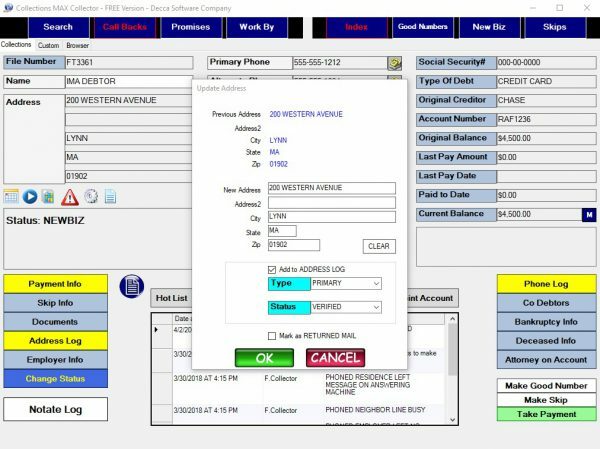 Integrated web browser allows the collector to pull up account information easily for skip tracing on other websites. 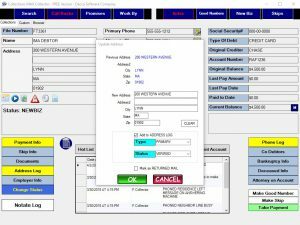 Software can be used with our Screen Pop Web Service for dialer screen pops. Alert system lets a collector or a manager tag an alert on the account that will flash before an account is shown. 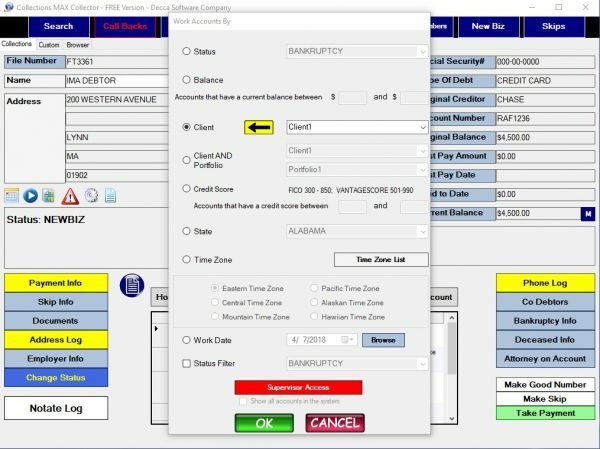 Setting allows an Administrator to restrict the software to only show the last 4 digits of the debtor’s social security number and prevent changes to debtor names..
Time zone alert system will prompt collector not to call account if the address on the account is outside the time zone rules. Status system can change colors for different status names allowing collectors an easy identification method for accounts. Unlimited notes can be created by the collector. There is also a fast select feature for the most used notations. 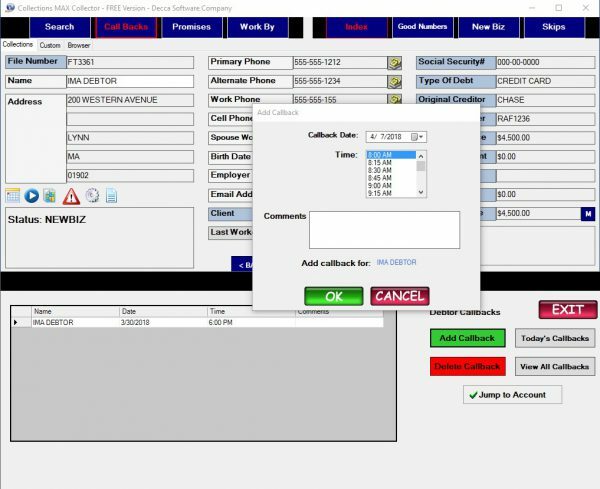 Integrated click to dial system allows you to connect this software with basically ANY soft-phone that uses URI’s or SKYPE. Built in shuffle system automatically rotates accounts from the last worked date so your collectors will always be working the oldest accounts first. Send emails and attachments with automatically populated account data using pre-made email templates. Collectors can schedule letters to be printed by an Administrator. Take both one time and post dated payments. Military grade AES encryption protects sensitive payment data at rest and in transit. The software uses TLS 1.2 encryption for processing credit cards. 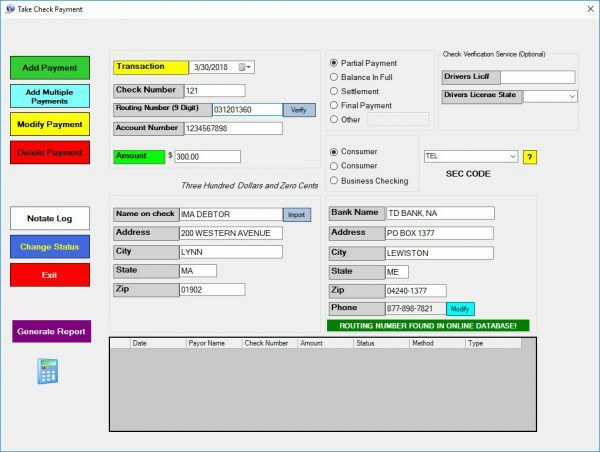 Software can verify routing numbers for checks in real time via API and populate banking data for collectors. Promises system keeps track of debtors who promise to send in payments. 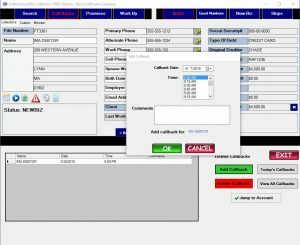 Callbacks system will automatically popup a callback notification when a callback is due. A collector can set their own callback reminders. As collectors work their accounts they can place the accounts in sub status’s like Good Numbers or Skips. This allows them to easily retrieve these accounts with a single click. 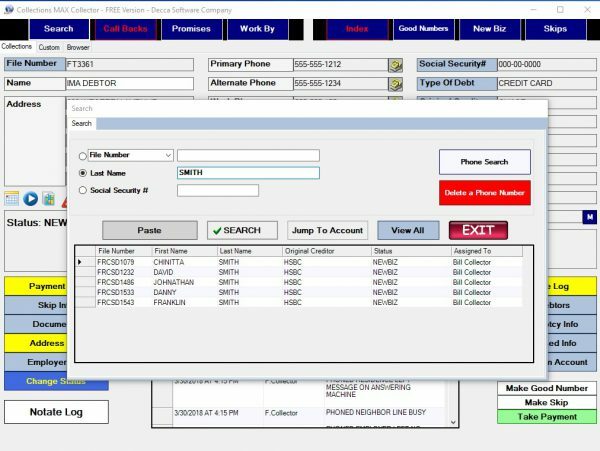 Dupes system shows multiple debts from the same debtor on screen and tallies the final amount. 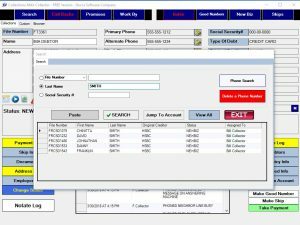 Collectors can easily remove any wrong numbers system wide using a single interface. Summary button shows collectors their account summary with both current month and current year totals. Document Imaging system allows you to link documents directly to any account. Inventory viewer allows collectors to view account inventory as a list. Hot list system keeps track of debtors who are willing to pay. Automatic Updates makes sure that you are always using the latest version of the software. Address and Phone logs keep track of past and present debtor information on each account. 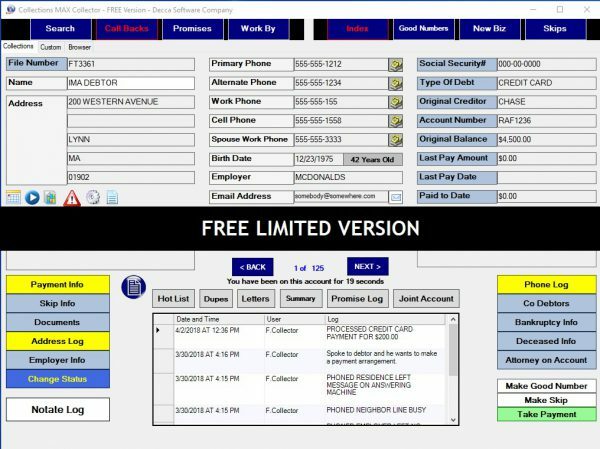 Skip Info system allows you to paste skiptrace information directly on any account. NSF alert system instantly alerts your collectors to debtors that have bounced payments for fast recovery of funds. This software is free to use. Upgrade to our Collections MAX Professional product to eliminate all limitations with this free version. *	Requires a compatible merchant account from one of our partners. 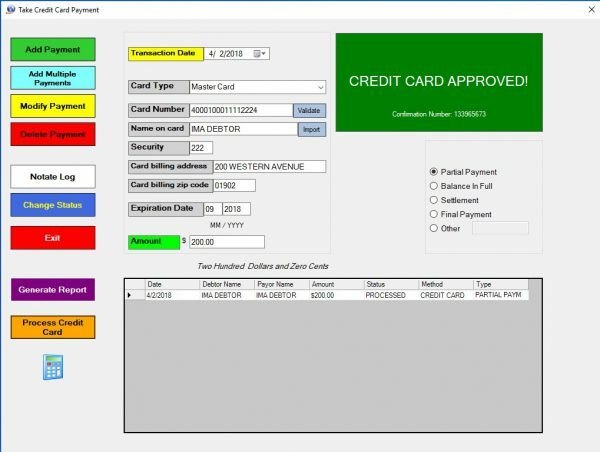 The integrated payment processing in our software is only available to our payment partners below (as a free integration) . You can click on their link above to visit their signup page and obtain a merchant account from them or you can also visit our partners page at the url below. We restrict our free integration for payment processing to our payment partners because some software titles like (Collections MAX Administrator, Collections MAX Database Installation Wizard, and Collections MAX Scheduler) are given away for FREE and are only subsidized by the revenue received from our partners for payment processing. 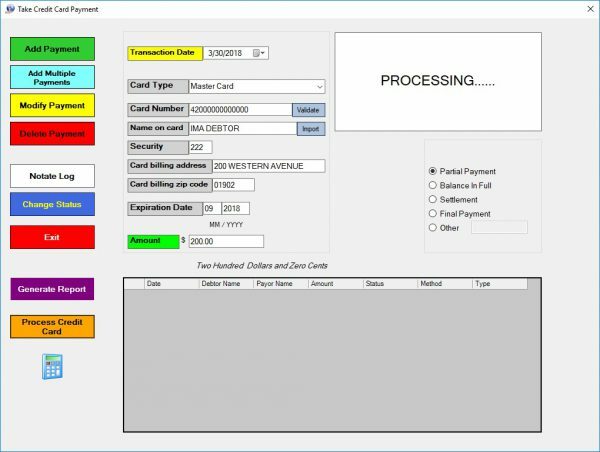 We can also integrate a non payment partner that uses the USA EPAY gateway .....however there will be an added cost to this type of integration. No other company that we know of gives away as much free debt collection software as we do.